From July 20 to September 4, tourists and Parisians looking for a “staycation” can have tons of summer fun – 3,500 tons to be exact – on sandy shores of Paris Plages! 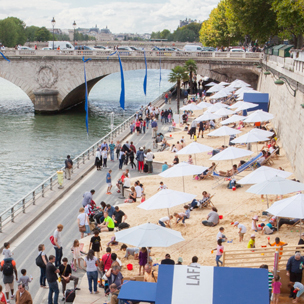 For the 15th year in a row, Lafarge France, member of the LafargeHolcim Group, has teamed up with the city of Paris to create a bona fide beach along the Seine River using eco-friendly logistics! Coming straight from the Bernières quarry in Normandy, the sand traveled 175 km down the Seine River to bring a bona fide beach to the famous riverbanks of Paris. All 3,500 tons of sand for the Paris Plages event were delivered using a single fleet of three barges and one pusher craft. Coming by road, the same trip would have required nearly 250 trucks and emitted triple the amount of CO2! Paris Plages is not the maiden voyage with this means of eco-friendly transport for the French branch of the Group. The company is one of the country’s waterway transport leaders, delivering between two and three million tons of building materials by river every year and using over 50 sites. This choice represents a major environmental advantage for Paris and the Ile-de-France region. What's more, it’s safe, economical and punctual, and creates no sound pollution or traffic jams! The event is one illustration of our commitment to building a more beautiful and more sustainable Paris for the world to enjoy. For those seeking beach reading or activities, Lafarge France is on hand at Paris Plages to provide helpful information about biodiversity. Younger beach bums can participate in 40-minute workshops where they’ll learn more about nature’s life cycles and sow their very own flowers, fruits or vegetables. As an engaged actor in biodiversity preservation in various countries where we operate, LafargeHolcim knows the importance of planting the seed of environmental stewardship early! Think summer is better in the city? Show us! To celebrate the joys of urban living in the warmer months, Lafarge France is organizing a photo contest, “Summer in the City”. Whether it’s picnicking in the park or strolling along the Seine through Paris Plages, show the world why nothing beats summer in the city by posting your photos on Instagram using the hashtag #villemeilleure (better city). A jury will choose 13 winning entries at the close of Paris Plages. Winners will have their picture displayed along the river bank between two iconic bridges in September, as well as take home an iPad and other prizes.